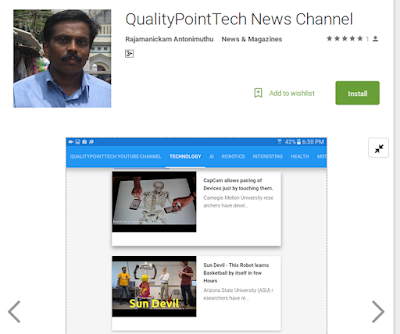 Released Free Android App for our YouTube Channel "QualityPointTech". As specified in many of my previous posts, our YouTube Channel "QualityPointTech" is growing steadily and therefore I am shifting my focus from web development business to our YouTube Channel. Though our channel is having variety of videos, like Motivational Quotes, GK, IQ Tests, Google Doodles and SQL Tutorial , my main focus is on giving latest Science and Technology News through our Youtube channel. Daily I am spending lot of time and effort to find latest Science and Technology News from various sources including Press Releases from many Universities, such as MIT, Stanford, Harvard and UC. And, I used to check various Science and Technology related groups in various social media websites. Apart from these sources, I used to explore various crowd-fuding sites like Kickstarter and indegogo, to find innovative products. And, I am cross-checking various other sources to make sure that I am giving genuine and latest news items. In short, I am taking many steps to make our youtube Channel as the best place to get latest Science and Technology News. I had already uploaded lot of Science/Technology Videos covering various topics, like Robots, Drones, 3D printing, Nano Technology, CRISPR Gene Editing, Material Science, Artificial Intelligence/Machine Learning and Gadgets. So, I believe People who are interested in knowing latest Science and Technology News will like our YouTube Channel. And, I wanted to make our Channel Videos easily available to them. And, therefore I have released an Android App for our youtube Channel. Apart from showing our own YouTube Channel Videos, this Android App will be showing Popular and Latest Technology News Videos that are collected from the entire youtube site using YouTube's auto-generated playlists. You can freely install this App from Google Play Store or Amazon App Store. And, I expect your suggestions to improve our channel further. If you are expert in any technology and willing to share your knowledge with our channel viewers, I welcome you to contact me through the email. And, refer our YouTube Channel and Android App to your friends who may be interested in watching latest Science and Technology news and other useful videos.